Over the past 17-years and despite the ongoing conflict drugs production has surged to record levels in Afghanistan. In July 2000 it was reported that the Taliban had banned the cultivation of poppies for opiates, claiming it was “un-Islamic”. By May 2001 that ban had all but put an end the country’s drug trade. In one growing season alone the country’s drug production ground to a virtual halt. Five months later New York was rocked by the World Trade Center attacks, however. Following Sept 11 it was reported that the alleged mastermind behind the attacks, bin Laden, was hiding somewhere in Afghanistan. Weeks later a U.S. led invasion was underway and although bin Laden was never located in Afghanistan the country’s drugs trade was quickly restored. Of course this is all now history but it is vital to understanding what has happened in Afghanistan. Bin Laden was not the reason for the U.S. led invasion. Like claims that he was the mastermind behind 9/11, that was just a smokescreen. The restoration of the country’s drugs trade was the real reason and that’s why the U.S. and its coalition allies are likely to remain in the country. Ed. An unprecedented surge of high quality and low-cost Afghan heroin is bound for the world’s streets after the country’s opium crop jumped two thirds to record levels, the United Nations has warned. 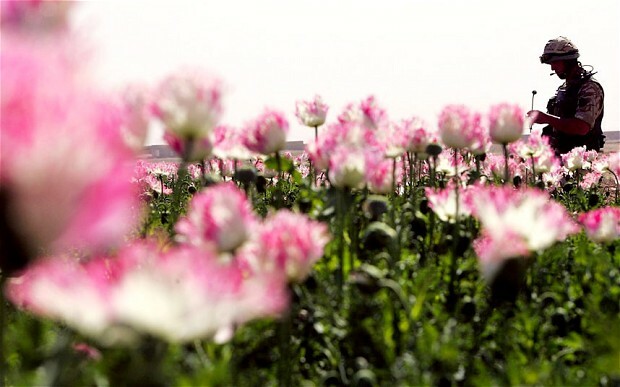 Afghanistan’s farmers grew more than 1,250 square miles of opium poppy last year, paving the way for potentially unseen levels of heroin production. The bumper crop has the potential to make up to 900 tonnes of high purity, export quality heroin the UN’s Office on Drugs and Crime said. Afghan opium already provides more than 90 percent of the world’s heroin and 95 percent of that found on Britain’s streets. The trade also finances militant groups such as the Taliban, forcing the UK to spend tens of millions in the past 15 years trying to destroy poppy crops. But production in Helmand province alone, the capital of opium growing where Britain spent eight years trying to wean Afghans off the crop, has risen by 79 percent in a single year. “With the record high of production in 2017, a wave of high quality, low-cost heroin is expected to reach consumer markets across the world,” the UN warned. Poor security and the Kabul government’s lack of control in swathes of the country were blamed for the burgeoning trade. Opium now dwarfs all other sectors of the Afghan economy, despite a 17-year-long international aid campaign to try to rebuild the country after the Taliban regime was toppled in 2001. The crop was worth up to £5bn, or nearly a third of the country’s entire GDP, while legal exports are worth only around seven percent. Many billions more are made further down the drugs pipeline, as it is smuggled across the Middle East into Europe. Impoverished farmers are now increasingly reliant on the crop, and it is now the backbone of Afghan agriculture, making efforts to curb the trade harder. Britain has scaled back in recent years on aid efforts designed to encourage farmers to grow crops other than opium, but the National Crime Agency works with Afghan police to try to catch traffickers or seize their wealth.